You guys all know how much I love to photograph raptors. I have posted many images of Red-tailed Hawks several times during the history of this blog. 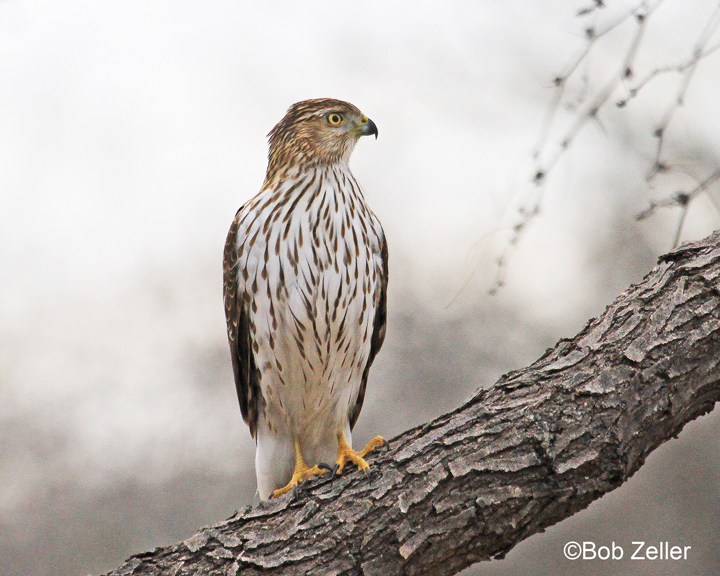 Today I will feature several photos of the Cooper’s Hawk and of the Sharp-shinned Hawk. These hawks are some of favorites along side of the red-tailed. In fact, the sign on the side of my car features a Cooper’s Hawk, as do my business cards. The following photographs were taken over the past few years. 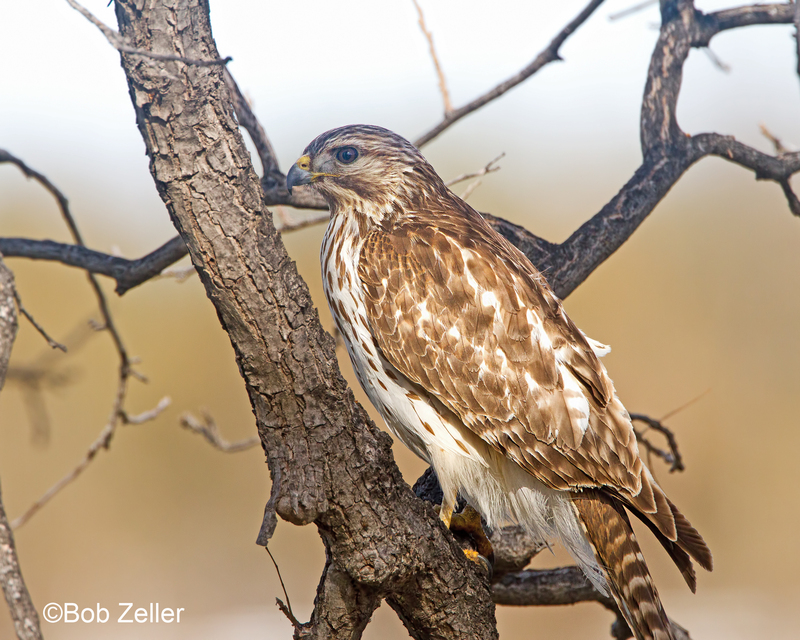 There is much similarity between the Cooper’s Hawk and the Sharp-shinned Hawk. The difficulty in making the right ID has me hoping that I made the right choice in naming these. On a side note, when I photographed the top image, I was at the bird blind at San Angelo State Park. Sitting next to me, co-incidentally, was Jim Miller, a fellow blogger and photographer from San Antonio, Texas. Somewhere in his files, he has a photo nearly identical to mine. The following is an image that I believe to be a Sharp-shinned Hawk. You can see and understand the difficulty in identifying these two species. I am sure that there will be letters and controversy after I post this. It would have been easier if I had a photo of the both of them, sitting side by side. 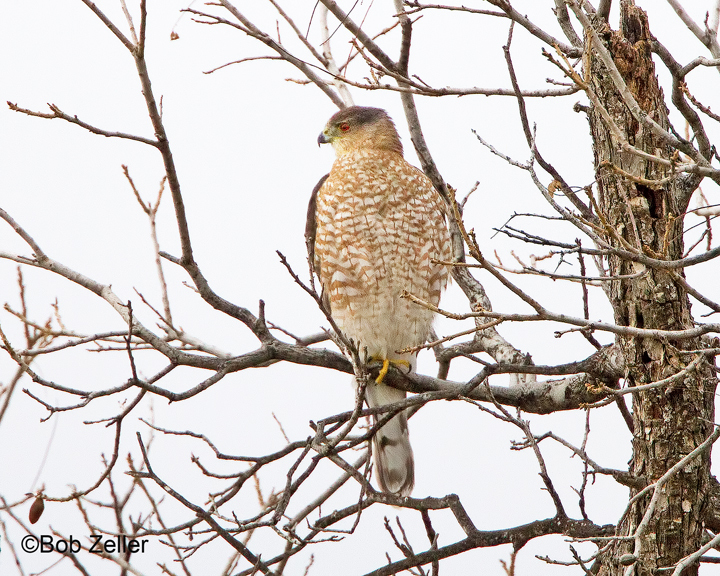 It would show that the Cooper’s Hawk is a good 5 inches taller than the Sharp-shinned Hawk. I was, at first, reluctant to post the last, (above) photo. Simply because I had clipped the tail. But upon further consideration, I felt that it was too good an image to just discard it. So, enjoy the photos. Click on any of them to see enlargements. 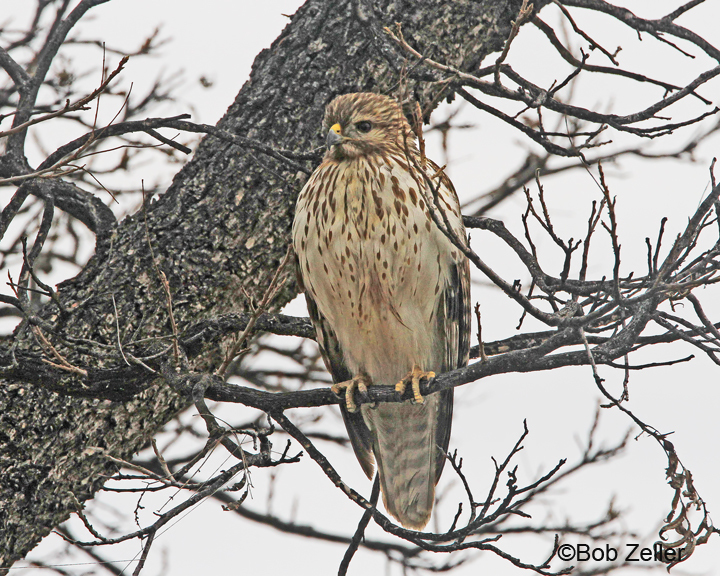 This entry was posted in Birding and Photography and tagged birding, birds, blog, blogging, bob zeller, Canon EOS 7D, Cooper's Hawk, nature, photography, red-tailed hawk, san angelo state park, sharp-shinned hawk, texas, wildlife. Bookmark the permalink. Mia is correct. First bird is juvenile Cooper’s; second is adult Cooper’s; third is juvenile Red-shouldered Hawk; fourth is also a juvenile Red-shouldered Hawk. There are no Sharp-shinned Hawks on this page. Thanks, Tim. This post was written five years ago, and I must say that I was pretty new at bird identification at that time. Thank for correcting me. I’m in central Austin and had the rare pleasure this mid-morning of seeing a gorgeous juvenile perched on a five-foot chain link gate not 25 inches from my window. Admired this bird’s plumage for about 20 minutes, and was very happy to find your photograph (I’m no photographer) to confirm my guess! The third “Cooper’s Hawk” (as you’re going down the page) is a juvenile Red-shouldered Hawk, as is the hawk deemed “Sharp-shinned Hawk”. Notice the shorter projection of the tail and its finely banded pattern, as well as the barring on the folded wing secondaries. This is one of those always-difficult identifications that drive me crazy- great pictures, Bob! A point very well taken, Mia, it could be very well be that you are right. Nice photos of both species, Bob. And I enjoy the discussion about ID. I too have a very difficult time distinguishing the two species and must admit that I rely to some degree on the fact that Coopers are more common in my area than are sharpies. Thanks very much, John. I feel the same way. Liked the first shot of the Cooper’s Hawk in particular, Bob! I wanted to send you an email but cannot find an adress so I hope you don’t mind me using your comments site. My wife and I have visited Big Bend several times in the past and have always stayed at the lodges in the Chisos Basin. We are going there again in April but this time, after following your advice, we will be staying at the Far Flung Casitas. I have had a look at the reviews on Trip Advisor and they all agree with you that they are excellent. Some of the reviewers say that it is better to stay in a cabin that faces the road as it is easier to unload/load your car. As we are both well into our seventies that advice sounds very attractive but could you please let me know if that is good advice or not or whether access to the other cabins is no problem? Keep tweeting as they are always enjoyable to read. Hi Dave, nice to hear from you. If you ask for cabins #1, #2 or #3, you will be by the road and they are much easier to unload from.. Also #7 is pretty easy, and #12, the handicapped cabin, is easy if available. We stayed in #12 the last time. Tell them “i sent you”. 🙂 Have fun. (We have stayed there 4 times, so far). Thanks Bob,your advice is very much appreciated. Thank you so much, Karen. I appreciate you. Love the Cooper’s. As far as I’m concerned you are the expert! Great series! see, I didn’t check my books. Thanks Bob, it is always a pleasure and i learn, too. LOL What do any of us know? Hmmm… they really are hard to tell apart. Now you have me wondering about my hawk visitor. Great photos as always Bob. Super photos of these wonderful hawks Bob! Thanks, Phil. I appreciate it. Great shots, Bob. One way to tell a Sharpie from a Cooper’s is the eye always looks larger in the head on the Sharp-Shinned, which it definitely does in your last photo. The third Cooper’s Hawk photo has me a little confused because the banding on the tail is so pale and the bands aren’t as thick as what I’m used to seeing, but don’t ask me what else I think it looks like, I’m not real good with hawk IDs. I know how difficult it is to ID these two species, you’ll get no arguments from me on that count! Thanks for the great photos, every one I see helps me when I have to ID them. Yeah, shame about the tail, but thanks for letting it make the cut. The one preceding it is my fav! I’ve been seeing what (from a distance) looks like an osprey, but given there’s no water around the area where I see him, I’m wondering if he’s a sharp-shinned. I’ll take my camera bag next time I’m out that way — appears to be a regular there. Yes, get a shot of it and we will see if we can ID it. Thanks for the comment, Shannon. Boy, you’ve got me – however these are all nice looking raptors! Thanks, Beth, for the compliments.